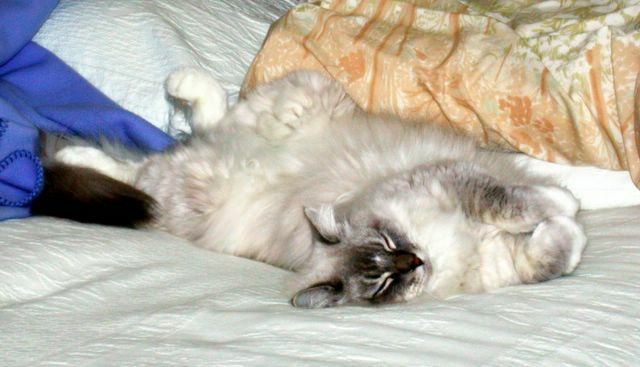 Mélange: Is This Cat Lazy, Or What? Is This Cat Lazy, Or What? Nicholas (Nicky) sleeps all night with the others in the sunroom, usually on the top perch of the cat tree. After a leisurely breakfast, he ambles slowly towards the master bedroom. Here he takes his place on top of the bed, occasionally burrowing under a throw. Here he stays all day, and I really mean all day. Sometimes he is alone, sometimes he sleeps with my mom. In the evening he might lumber through the house for another snack but then it is either back to the bed or to a recliner in the den. Here he props himself up as if to watch TV. Around 8:30 PM he starts the "shoo-shoo" process and moves slowly for the sunroom. He never runs, rarely meows and never begs. He is one lazy cat. Submission for PhotoTuesday topic "lazy".